Short Information : Time table for Madhya Pradesh Board Class X Examinations 2019 has been announced three months in advance so that students get time for preparation. The exam starts on March 5, 2019 and concludes on March 31st, 2019. All the examinations are of 3 hours duration, and will begin from 9am IST. Saturday 31. Mar. 2019 (NSQF) IT/ ITES, SECURITY VOC. Madhya Pradesh Board of Secondary Education (MPBSE) conducts Madhya Pradesh Board 10th class exam. Results of the Madhya Pradesh Board 10th examination are generally declared 2 months after the successful completion of the examination process.Madhya Pradesh Secondary Education Board or MP Board will start 10th Class Examination 2019 every year in the month of March. Students are advised to collect official MPBS 10th Time Table 2019. Students will eventually be able to download their MP board 10th Time Table 2019 for both mediums. The first is Hindi medium and then the second is English medium. So if you ultimately officially download MP Online 10th Class Time Table 2019. Conclusion : For more detailed info regarding to MP Board 10th Time Table 2019 Hindi/English Medium kindly visit official website and read carefully before applying against to MP Board 10th Time Table 2019 Hindi/English Medium . 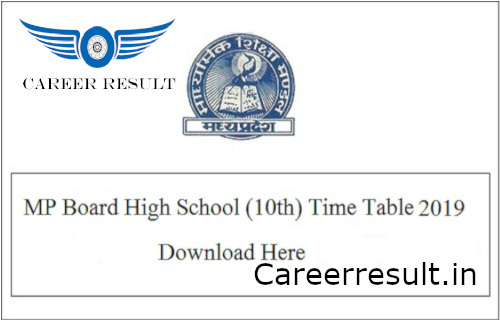 Subscribe Careerresult to get latest updates about MP Board 10th Date Sheet 2019 on your smartphone via E-mail. All candidates have to request is to share this job link with your friends over at Whats App, Facebook ,Twitter,Instagram and help them get Latest Updates in Govt Jobs and make good career in your life.